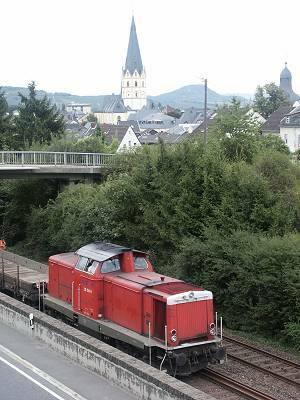 on saturday 18 October 2008 a steam train with class 52 2-10-0 engine will visit from Siegen via Cologne. On 6th of December 2008 class 41 41360 vill visit for the "Lucia"-Cristmas market. VEB owned 2-10-0 52 6106 will visit the same destination on 7th of December 2008. Historic steam engines will provide several rides along the Rhine and Lahn rivers on the weekend of 31 May and 1 June, celebrating 150 years of railways. both weekends 15/16. 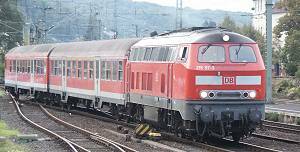 and 22/23 October '06 class V100 diesel hauled trains with 4y and 3y class coaches will run between Remagen and Kreuzberg. The train leaves Remagen on 10:25, 14:25 and 18:25 to Kreuzberg. These trains cost no upcharge. On Sunday 18 September 2005 a railfest will be held in Bad Neuenahr station from 10:00 til 20:00 o'clock. 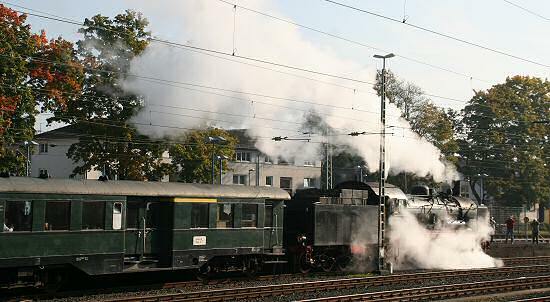 The first steam train this day will depart Remagen au 10:25, possibly by a class 23 steam engine. In Bad Neuenahr will be a exhibition of engines and saloons, possibly: class E03, V100, V 218, RS1, Rheingold coach, historic post waggon. 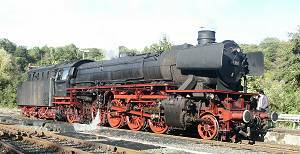 On saturday 18th the Betzdorfer 1-5-0 class 52 will travel to Mayschoß and continue on to Kreuzberg for watering. A week later 1-4-1 T18 will steam a similar timetable. On sunday 21. Sep 03 the society to preserve the train depot at Kreuzberg offeres a guided tour in english language. The tour will start at 10 o'clock at Kreuzberg station. In September and October 2003 the EPEG will visit the Ahrtalbahn several times. 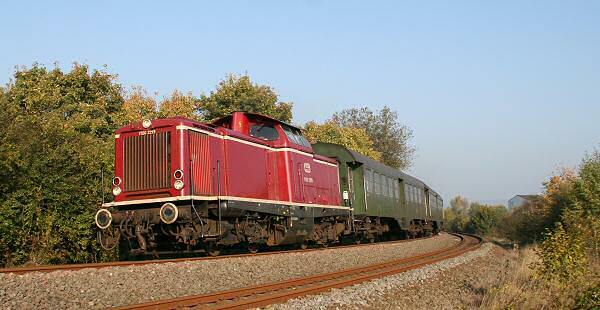 On the 28th ex-prussian T18 78 468 will visit Dernau and on Oct 25th Mayschoß. The steam engine will then continue to Kreuzberg for watering. from Aug 17 til 29th 2003 there will be a bus shuttle service between Ahrtweielr and Ahrbrück, as the down-track will be replaced between Ahrweiler and Walporzheim. on 19. Oct. 02 ex-prussian T18 78 468 should have returned to the Ahrtalbahn on a roundtrip from Cologne via Linz, Koblenz and Mayen, but due to a technical failure was replaced by V200.1 221 135. Class 215 diesel engines return each september and october weekend to help with the "Weinfest" tourists. 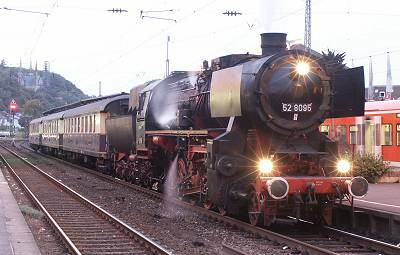 On Sep 17, 2-10-0 loco 52 8095 pulled a dinner-train consisting of 3 historical Rheingold coaches to Bad Neuenahr. On Sepember 9, 2002, a "day of the opened monument" will be held in Germany. On this day listed monuments that are usually closed to the public are opened to be visited by the interested public. 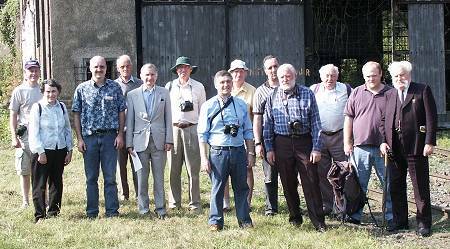 The society to preserve the train depot at Kreuzberg offered a guided tour in english language to visitors from the UK. The aim of the European Heritage Days is "to bring European citizens closer, not only to their cultural heritage, but also to each other, in order to achieve a better and mutual understanding despite the diversity of cultures and languages". The immense success of "Tempo, Takt und Dampf" has persuaded the authorities to continue. 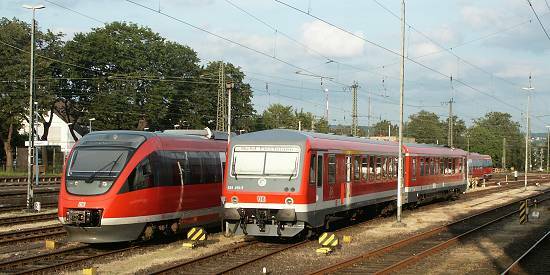 Plandampf has been fixed in a contract beetween the government of Rheinland-Pfalz and DB Regio. The next event is planned for fall 2002 in the "Westerwald" (beautiful and scenic hills in the northeast of Rheinland-Pfalz. 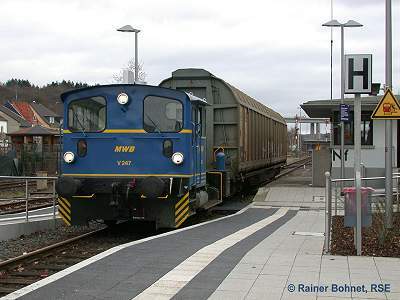 Due to upgrading of the VT 6423 railcars a single VT 628 railcar is used weekdays for the hourly Remagen-Dernau shuttle since June 17th. On Feb, 8th 2002 the private railroad RSE (Rhein-Sieg-Eisenbahn) re-continued the freight distribution the Ahrtalbahn. DB Cargo discontinued it's services last September as a result of the MORA C scheme. Due to a shortage of "Talent" class 643 railcars the 215 class diesels returned to service the Ahrtalbahn. DB Museum steam returned to the Ahrtal in September and October. 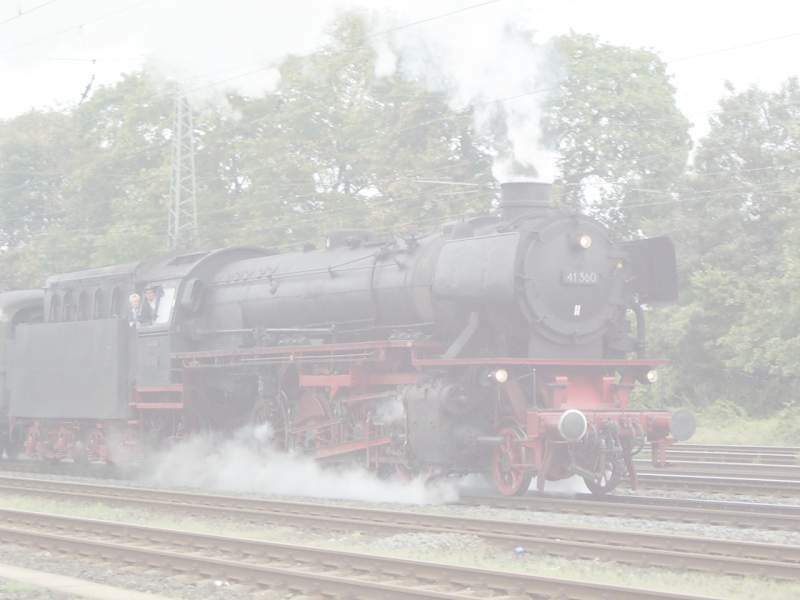 From Sep 9th until Oct. 8th "Mikado" 41 360 steamed every weekend from Düsseldorf to Kreuzberg. Between Remagen and Kreuzberg the regular fare applied, as the steam train run as "Plandampf" for DB Regio. On July 10th, track lifting started on Hönningen to free the trackbed for a new bypass road. 215 138 returned until end of June and made 3 runs to Ahrbrück from monday to friday. Due to the warmer weather the freight trains serving Apollinaris-Schweppes in Bad Neuenahrt are much longer. On Jan. 01, 2001 the preservation society "Museum-Bw Kreuzberg" took over the 50.000 square meter area of the MPD. 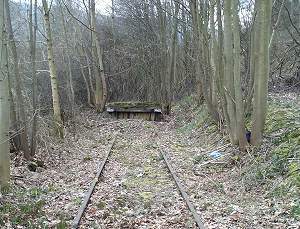 The first aim was to clean the trackwork before springtime. On Mar. 17th the farthest bufferstop was visible the first time in more than a decade. From June 10, 2001 EMUs of the class ET 425 will serve the Wuppertal - Koblenz trains. From 5th November on railcars of the "Talent" family took over passenger services from the 215 class loco-hauled trains. 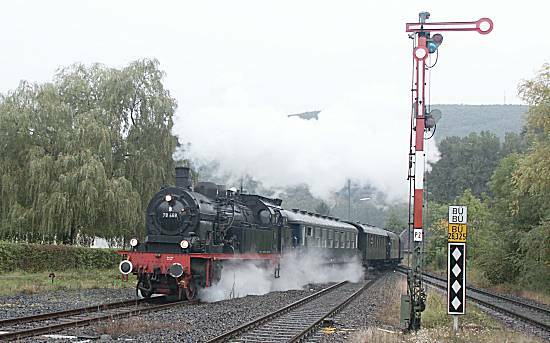 From September 16th until October 8th "Mikado" 41 360 steamed every weekend from Duesseldorf via Cologne and Bonn to Dernau in the Ahr valley. On September 23rd, 24 009 visited the Ahr.